For other uses, see Gravedigger (disambiguation). Grave Digger is a monster truck racing team in the Feld Entertainment Monster Jam series. There are nine Grave Diggers being driven by different drivers to allow them to make appearances at more events, but their flagship driver is/was creator Dennis Anderson. Grave Digger is considered to be one of the most famous and iconic monster trucks of all time. Grave Digger was originally built in 1982 by Dennis Anderson as a mud bogger. This first truck was originally a red 1957 Ford pickup truck. The truck received its name when Anderson, amicably trash talking with his fellow racers, said, "I'll take this old junk and dig you a grave with it", a reference to the age of his old pickup in comparison to their relatively modern trucks. Anderson gained a reputation for an all-or-nothing driving style and quickly became popular at local events. At one show, a scheduled monster truck failed to show up and Anderson, who already had large tractor tires on the truck, offered to crush cars in the absence of the full-size monster. The promoter accepted and Grave Digger was an instant success as a car crusher and led Anderson to leave mud bogging and pursue monster trucks instead. In 1984 Anderson rebuilt the truck as a true monster truck using a 1951 Ford panel van body originally sporting a silver and blue paint scheme. In 1986 Grave Digger first received its famous black graveyard paint scheme. In 1987 and 1988 Anderson drove the truck primarily at TNT Motorsports races and became a crowd favorite for driving hard despite lacking major funding that better-known teams, like Bigfoot, had. In 1987, Anderson beat Bigfoot in Saint Paul, Minnesota on a show taped for ESPN. It was the first major victory for Grave Digger. When TNT became a part of the United States Hot Rod Association in 1991, Anderson began running on the USHRA tour and debuted his first four-link truck, Grave Digger 3. Throughout the 1990s, the popularity of the truck grew and forced Anderson to hire other drivers to run other Grave Digger trucks. Grave Diggers 4, 5 and 8 were built to suit this purpose, and were never driven in any major capacity by Anderson. Anderson drove Grave Digger 7, a direct successor to 3, for most of the decade. It was replaced by Grave Digger 12, well known as the "long wheelbase Digger", which was also the first Grave Digger with purple in the paint job. In late 1998, Anderson sold the Grave Digger team to Pace Motorsports (now Feld Entertainment). Anderson continued to drive, being the most visible member of the team, and remained in charge of drivers and of training inexperienced team Grave Digger members. Anderson competed in his final event on January 14, 2017 at Raymond James Stadium in Tampa, Florida. On September 18, 2017, Dennis announced his full retirement from Monster Jam, stating however that he would still be behind the scenes and in the pits. Gary Porter also won the WMTRL Championship in 2004 driving Grave Digger #12. Many Grave Digger team drivers have won world championships in other trucks. Regular Grave Digger driver Pablo Huffaker won the 2007 Monster Jam Freestyle Championship driving Captain's Curse, and son of Dennis Anderson, Adam Anderson won the freestyle championship in 2008 driving Taz, and Grave Digger driver Charlie Pauken won the 2010 Monster Jam World Finals Freestyle Championship driving Monster Mutt. In 2013-2014, Adam Anderson won back-to-back world championships but this time in racing, driving Grave Digger The Legend. In 2016, it was the year of Grave Digger. Morgan Kane captured the Amsoil Series West Championship behind the wheel of Grave Digger #25, while Cole Venard, driving Grave Digger #31, took the Amsoil Series East Championship. Adam Anderson drove Grave Digger #32 to the FS1 Championship Series title in dominant fashion. At the World Finals, Morgan Kane won the World Racing Championship in 2016 driving Grave Digger #25. Adam Anderson took the World Freestyle Championship the following night driving Grave Digger #32. Charlie Pauken, Adam Anderson, Tyler Menninga, and Morgan Kane all competed in Grave Digger trucks at World Finals 19, with Anderson winning another racing championship. There have been a total of 38 Grave Digger monster trucks built. There are seven trucks running. Grave Digger #2 – Leaf-sprung race truck was rebuilt with a new frame for the world record sound crossing, now sits out front of the shop to draw in visitors. Grave Digger #3 – Race truck. Rebuilt into WCW Nitro Machine in 2000, then Inferno in 2001; and continued to run as Inferno until it was retired in 2007. Grave Digger #4 – Jack Koberna built leaf-spring race truck, ran 1990 to 1996. Grave Digger #5 – Racesource designed race truck. Originally ran as Jus-Show-N Off/Purina Mainstay from 1992 to 1995. Chassis sold to Mark and Sherry Wheeler formerly of the Terraduster Monster Truck Team and ran as Brett Hart and Stone Cold Steve Austin sponsored WWF Wrestle Trucks. When the sponsorship ended, they ran it as Terraduster until they left the industry in 1999. It has been sold many times since, and was last ran as Dave Radzierez's Diesel Monster Truck. The Grave Digger body that the truck ran sat in the team store for children to climb on for some time. Grave Digger #6 – Rebuilt as the Son-uva Digger mud bogger. Was originally the "Street Digger." Briefly ran as the Bog Hog mud truck, now named Old #Six. Grave Digger #7 – Race truck. Retired and displayed at the team's headquarters, Digger's Dungeon. Grave Digger #8 – Race truck. Retired from competition, was on display as part of a temporary museum exhibit in Chicago. Now it sits on display around the front of Diggers Dungeon. Grave Digger #9 – Ride truck, sold and is now Extinguisher, a ride truck. Grave Digger #10 – Racesource designed race truck. It became Radical Rescue. The chassis has been retired and scrapped. Grave Digger #11 – Ride truck, ran as the War Wizard ride truck but was then owned by Randy Brown and he turned it into the Pure Adrenaline ride truck in March 2010. Starting at the 2012 World Finals, it ran as a Grave Digger 30th Anniversary ride truck. It was rebuilt in 2013 and currently runs as a Grave Digger Ride truck. Grave Digger #12- In-house designed race truck. Originally retired in 2010 as a Grave Digger after a crash in Wildwood, New Jersey, the truck was refurbished for 2011 due to a last minute change where Tony Farrell had to drive the second Grave Digger: The Legend as a field-filler for Son-uva Digger. It is now retired. Grave Digger #13 – Skipped per superstitions regarding the number 13. Grave Digger #14 – PEI chassis race truck. Retired in 2010. Grave Digger #15 – Racesource chassis race truck. Retired in 2008. Grave Digger #16 – Racesource chassis race truck. Retired in 2013. Grave Digger #17 – Pro Modified drag racer sponsored by the team. (The IHRA and USHRA were previously under the same ownership.) No longer racing. Grave Digger #18 – PEI chassis race truck. Retired in 2012. Grave Digger #19 – In-house chassis race truck. Retired in 2014. Grave Digger #20 – In-house chassis race truck. Retired in 2013. Grave Digger #21 – PEI chassis display truck. The truck sits in a BKT-sponsored trailer where fans can sit in the cab of the truck. Grave Digger #22 – PEI chassis race truck. Originally ran as Batman from 2006 to 2008. Appeared on Conan in 2012. Retired in 2013. Grave Digger #23 – Carroll Racing Development (CRD) chassis race truck. Retired in 2017. Grave Digger #24 – In-house chassis race truck. Retired in 2015. Grave Digger #25 – In-house chassis race truck. Retired from competition in 2016. The truck was used at Monster Jam university in 2017 to train new drivers. The truck is now retired and scrapped. Grave Digger #26 – In-house chassis race truck. Retired in 2016. Grave Digger #27 – Carroll Racing Development (CRD) chassis race truck. Retired in 2018. Grave Digger #28 – Racesource chassis race truck. Retired from competition in May 2018. Now a display truck. Grave Digger #29 – In-house chassis race truck. Currently serves as a back-up truck, used mostly for international shows. Grave Digger #30 – In-house chassis race truck. Retired in 2018. Grave Digger #31 – In-house chassis race truck. Currently driven by Brandon Vinson. Grave Digger #32 – In-house chassis race truck. Originally ran as "Grave Digger: The Legend", a special retro paint scheme, for the 2014–2015 season. Retired in 2018. Grave Digger #33 – In-house chassis race truck. Currently driven by Morgan Kane. Grave Digger #34 – CRD chassis race truck. Currently driven by Krysten Anderson. Grave Digger #35 – In-house chassis race truck. Currently driven by Adam Anderson. Grave Digger #36 – CRD chassis race truck. Currently driven by Tyler Menninga. Grave Digger #37 – CRD chassis race truck. Currently serves as a back-up truck, used mostly for international shows. Grave Digger #38 – CRD chassis race truck. Currently driven by Charlie Pauken. Grave Digger #39 – CRD chassis race truck. Currently driven by Randy Brown. Grave Digger is well known for its gnarly crashes. Grave Digger's origins, the imagery associated with the truck, and the truck's wild reputation, are all considered part of the mystique of the truck and have contributed to its continued popularity. Although originally a Ford, the 1950 Chevrolet Panel Van body has become the standard body for all trucks. Likewise, the paint scheme, combining green flames, letters dripping blood, a foggy graveyard scene with tombstones bearing names of competitors, a haunted house silhouetted by a full moon, and a giant skull shaped ghost, is considered a part of what Grave Digger is and, although being tweaked over the years, has not strayed far from the first incarnation of the paintwork from 1986. Perhaps the most visible trademarks are the red headlights which glow menacingly whenever the truck is in competition. The lights were first used when Anderson was building a transporter out of a school bus and removed the red stop lights. After realizing they would fit in the headlights of the van, he installed them and the truck has had them ever since. During the TNT days, announcer Army Armstrong started telling fans that when the red lights were turned on, the truck was 100% ready to run and Anderson was going to go all out. Fans began to take notice and Anderson, who would keep the lights off if something was not working properly, began receiving letters saying that he was not at 100% at certain shows because the lights were not on. To this day, the lights are turned on for every run. The reputation Grave Digger gained shot the truck to super stardom in the 1980s and continues to draw fans today. In the late 1980s Anderson gained the nickname "One Run Anderson" for his spectacular but often destructive qualifying passes which entertained the crowd but on many occasions put truck out of competition for the rest of the event. With the advent of freestyle, Anderson gained a means by which he could entertain the crowd with wild stunts while also focusing on winning races. 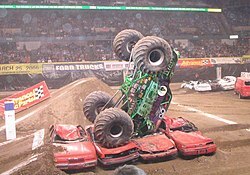 Today, Grave Digger, no matter which driver is appearing, is traditionally the last truck to freestyle at most events, providing the "grand finale" which caps off the show. These freestyles often end up in crashes, which Grave Digger is known to do much more frequently than other trucks. The crowd typically loves to see the wrecks but some criticize the team for what they feel is the glorification of crashing. The immense popularity of Grave Digger has made it the poster child for Monster Jam, and in some cases monster trucks in general. There is much debate over whether Grave Digger has taken over the title of "Most Popular Monster Truck" from Bigfoot. As a result, the Grave Digger vs. Bigfoot rivalry is one of the strongest in the sport, despite the fact that the teams have not raced each other regularly since the late 1990s. Drove Grave Digger: 2002–2012 seasons. Digger’s Dungeon, located in Poplar Branch, North Carolina, is the official home of Grave Digger. Besides the usual gift shop, there are several Grave Diggers located outside on display. There are also various pieces of other Grave Diggers hanging throughout the store, all of which have been damaged from various accidents. Digger’s Dungeon hosted the 2010 No Limit R/C Monster Truck World Finals, taking place from May 28-May 30. The RC World Finals is the largest RC Monster Truck event in the world. In 2009, Feld Motor Sports (the company that owns the Grave Digger brand) announced a contest whose winner would win a catered party, including the appearance of Grave Digger and its principal driver, Dennis Anderson. The winner of the 2009 sweepstakes was Randy Conrad of Myrtle Beach, South Carolina. At its height, the party had over 70 people in attendance. The 2010 Digger Block Party sweepstakes started on October 6, 2009 and ran until July 18, 2010. The winner received a prize package totaling around US $11,850 dollars, including the visit from Grave Digger and Anderson, as well as catering, prizes, a DJ, and party equipment. ^ "TESS -- Error". uspto.gov. Retrieved 21 March 2017. ^ "Poplar Branch, NC - Digger's Dungeon - Home of Grave Digger". Roadsideamerica.com. Retrieved 2010-03-08. ^ "Grave Digger". Grave Digger. 2009-09-14. Retrieved 2010-03-08.